Yes, I am back for more tonight. I think this will do it even though I would love to use more of the printables offered by Papertrey Ink's designers in honor of their 6th anniversary. Time and energy does not permit. You can see my first card HERE and more information about the printables HERE. 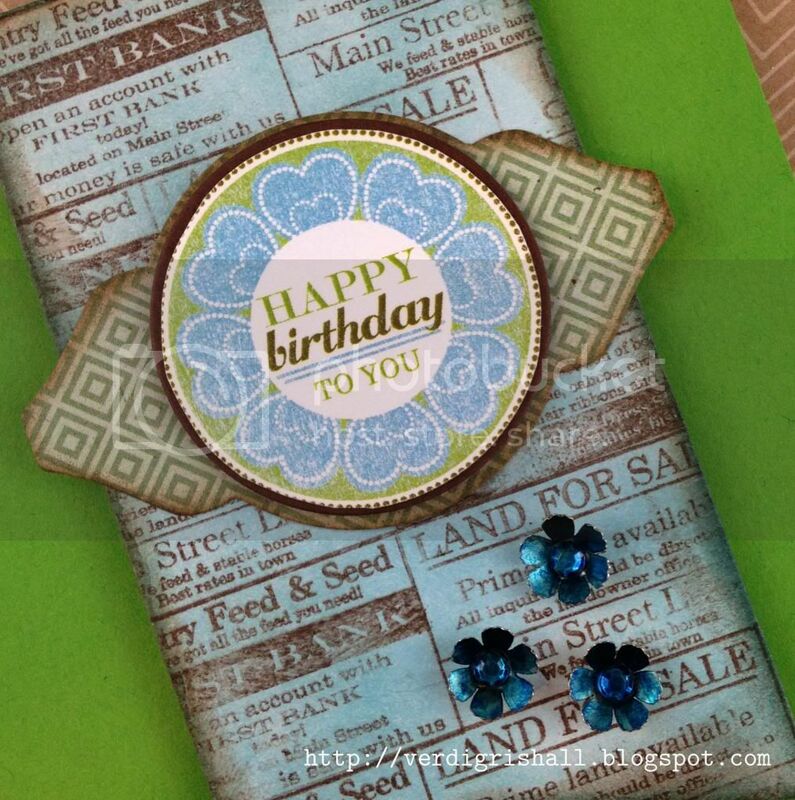 My next card uses the birthday printable by the talented and bright Dawn McVey. I really admire her bold, colorful and dynamic designs and projects. I don't have her skill, but I hope my card honors a bit with the pops of sensational leaf green and Hawaiian shores with a touch of chocolate brown thrown in for good measure. I decided to mount the printable on the simple circle die from Limited Layers: 1 3/4" circle dies cut from chocolate brown and then I mounted in onto a piece of patterned paper by Basic Grey cut with the Mat Stack 2 die and inked on the edges with dark chocolate ink. 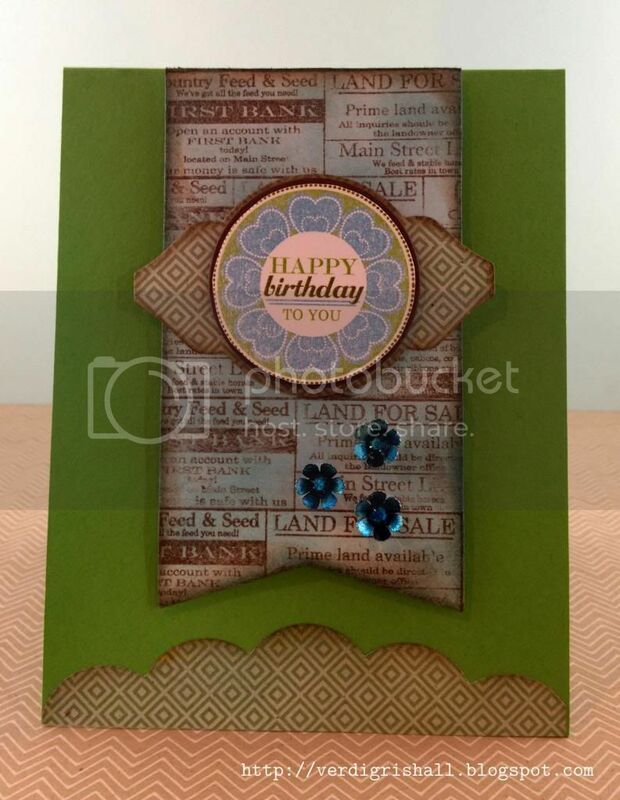 The printable stack was then adhered to a piece of die cut cardstock using the Wine Bottle Tag die that I then stamped with the Background Basics: Newsprint stamp using dark chocolate ink. I colored it in with tumbled glass and a little broken china and dark chocolate inks on the edges. I added three brads I colored in with Copic markers. 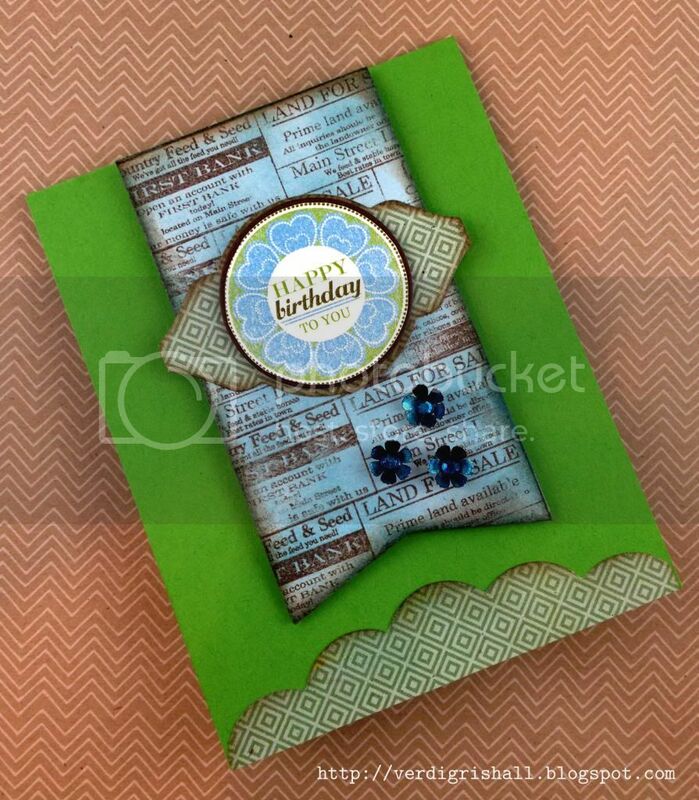 All of this was adhered with dimensional adhesive to a card base of new leaf cardstock. Lastly I added a piece of Basic Grey patterned paper die cut with the Edgers #1 Die Collection to the bottom of the card. Thank you so much Dawn McVey for years of crafting goodness! And thank you for stopping by to visit. Oh, this looks fabulous, Shay! I love it!